The club is a corporation without share capital. No one person or entity owns the team. The Winnipeg Blue Bombers are a Canadian football team based in Winnipeg, Manitoba. They are currently members of the West Division of the Canadian Football League (CFL). They play their home games at Investors Group Field after many years of playing at the since demolished Canad Inns Stadium. 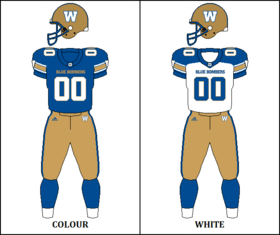 The Blue Bombers were founded in 1930 as the Winnipeg Football Club, which remains the organization's legal name today. Since that time, they have won the league's Grey Cup championship 10 times, most recently in 1990. With 10 wins, they have the third-highest win total in the Grey Cup among active and defunct CFL teams. Though they are currently the team with the longest Grey Cup drought, no other CFL franchise has as many Grey Cup appearances as the Blue Bombers' current 25. The Blue Bombers were also the first team not located in Ontario or Quebec to win a championship. Jack Jacobs, known as Indian Jack, was a Cree quarterback from Oklahoma. He came to the Bombers in 1950 after a successful career in the United States. He led the Bombers to two Grey Cup appearances, losing both. His exciting style of play and extreme talent increased ticket sales and overall awareness and popularity of the club. The revenue the Bombers were getting from their newfound popularity was enough to convince them to move from the small, outdated Osborne Stadium to the new Winnipeg Stadium (later known as Canad Inns Stadium). Jacobs was so well liked, the fans even referred to the new stadium as "The House that Jack Built". Jacobs retired in 1954 to become a talent scout for the team. In 1983, Cal Murphy was hired to be the new head coach of the Blue Bombers. Almost immediately, Murphy set the tone for his career with the Bombers by trading popular QB Dieter Brock to Hamilton in exchange for QB Tom Clements. Trading Brock turned out to be a wise decision, with Clements leading the Bombers to crushing victory in the 1984 Grey Cup, coincidentally over the Brock-led Tiger-Cats. This was Winnipeg's first Grey Cup in 22 years, and also their most recent appearance in the championship game as the Western representative. Murphy was named coach of the year in both 1983 and 1984. Milt Stegall joined the Bombers in 1995 after a three-year career returning kicks and seeing spot duty at receiver with the Cincinnati Bengals. He played in the Bombers' final six games of the 1995 season, racking up 469 receiving yards. In 1997, Stegall set a new league record that still stands today for average gain per reception with 26.5 yards on 61 catches for 1616 yards, including 14 touchdowns. Following a brief return to the NFL, that saw him on the verge of making the Green Bay Packers if not for a serious knee injury at the end of training camp, Stegall remained the team's primary receiver. With the offensive core of Stegall and Roberts still intact, Glenn led the Bombers back to respectability in 2006. The season included many highlights, but none as exciting at what is simply known as "The Play". On July 20, 2006, trailing the Edmonton Eskimos on the road 22–19, and facing third and long on their own 10 yardline with 4 sec left in the game, Milt Stegall caught a 100-yard TD pass from Kevin Glenn as time expired to win the game 25–22. It is considered by many as the greatest play in CFL history. Aided by the "miracle" catch, the Bombers ended up making their first playoff appearance in two years. Despite losing in the first round, optimism going into the 2007 was higher than ever. The 2007 Grey Cup game was played between the Winnipeg Blue Bombers and the Saskatchewan Roughriders, the first time the two prairie teams met for the championship. Winnipeg was defeated by the Saskatchewan Roughriders 23–19 in the Rogers Centre in Toronto. During the East division final win over the Toronto Argonauts, quarterback Kevin Glenn broke his arm and Winnipeg was left with an inexperienced rookie to take his place for the championship game. Back-up quarterback Ryan Dinwiddie — in his first CFL start — did not fare well and threw one touchdown pass, fumbled once and threw three interceptions to Saskatchewan cornerback James Johnson. Johnson was later declared the game MVP. The CFL returned to Ottawa in 2014 with the establishment of the Redblacks. 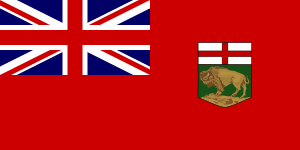 Initially, the league planned to keep Winnipeg in the East, at least for the short term, due in part to the ongoing competitive dominance of the West. Despite this, Blue Bombers management lobbied heavily to return to the West Division immediately, and eventually the league relented. The Blue Bombers finished last place in their first season back in the West, with a 7–11 record. ↑ Grey Cup 1935 "1935 Grey Cup" Check |url= value (help). CFL. Retrieved November 9, 2012. ↑ "Labatt Blue". Labatt Brewing Company. Archived from the original on April 1, 2009. Retrieved 2009-08-28. ↑ "Labatt renews long-standings relationship with Blue Bombers". Labatt Brewing Company. 2007-05-24. Archived from the original on April 7, 2009. Retrieved 2009-08-28. ↑ "Taman resigns player personal post with Blue Bombers". TSN. January 13, 2009. ↑ "Blue go from reverse to first". Winnipeg Free Press. November 6, 2011. ↑ "Swaggerville reincarnate". Winnipeg Free Press. September 19, 2011. ↑ "Official Site of the new Bomber Stadium". Blue and Gold. ↑ "Bombers accelerate stadium plan". CFL. March 31, 2010. ↑ "Asper out of $190M stadium deal". Winnipeg Free Press. 13 December 2010. Retrieved 2014-06-01. ↑ "First game in new stadium could be as early as Sept. 9: Bombers". Winnipeg Free Press. 25 May 2012. Retrieved 2012-05-02. 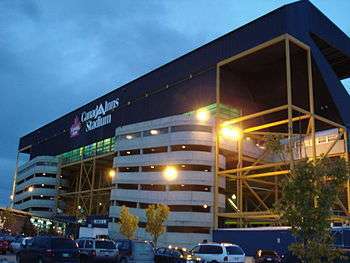 ↑ "Bombers to play entire season at Canad Inns Stadium". Winnipeg Free Press. June 15, 2012. ↑ "Bombers late to the party". Winnipeg Free Press. 28 June 2013. Retrieved 2014-06-01.